The number of people who died as a result of Hurricane Maria—which hit Puerto Rico on September 20, 2017—may be as high as 1,139, surpassing the official death count of 64, according to researchers. 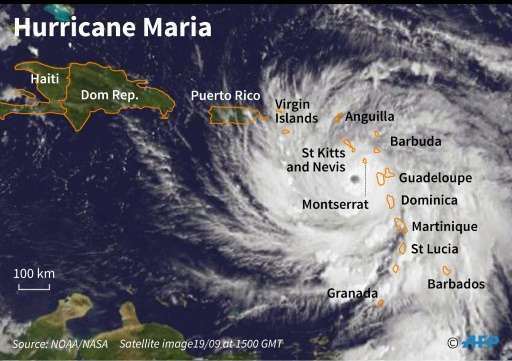 Alexis Raúl Santos, assistant professor of human development and family studies at Penn State, said the results—published today (Aug. 2) in the Journal of the American Medical Association — could help people better prepare for and respond to future weather disasters like Hurricane Maria. "The Caribbean is set to be hit by more weather disasters in the future, based on forecast models, and we don't want history to repeat itself," Santos said. "If we have a better idea of the damage that Hurricane Maria actually did, then maybe we can use that experience to inform and reshape protocols, policies and emergency management processes." Although the official death toll for Hurricane Maria still stands at 64, other estimates have previously placed the toll significantly higher. The official death toll counts only those with a "hurricane-related" cause of death on their death certificates, while other estimates have used data from government agencies or surveys, which may not be reliable. For the study, the researchers used official government records of deaths—vital statistics records—to find how many people died from any cause in Puerto Rico from January 2010 through December 2017. The data from before Hurricane Maria hit in September 2017 was used to determine the average expected deaths for each month. "When the area is flooded and without power, that's not a safe environment for a grandmother on dialysis," Santos said. "That's not a safe environment for someone who has an asthma attack and may need therapy. Essentially, that's what we're trying to address. Not just the people who drowned or died in landslides, but also the people who died because they didn't have access to their basic needs." "One of our aims is to start creating linkages between academia and the government to see how we can help and make things better for the future," Santos said. "Academia is here to help. All of us care deeply, we care about society and people, and want to help make things better for the future."